Before Donald Trump agreed to tape a second season of his hit reality show "The Apprentice," he says he told NBC he'd need a few things. More creative control would be nice, and perhaps flashier living quarters for the contestants. And how about a personal publicist? Then Mr. Trump took out his calculator. NBC paid him about $50,000 an episode the first season. But with his show winning huge ratings, Mr. Trump wanted a fat raise. He heard the six actors on the hit comedy "Friends" each took home about $1.5 million an episode so, as the sole star of "The Apprentice," he figured he should get $9 million per show. Still, his program ran an hour and "Friends" just 30 minutes. Mr. Trump bumped the figure to $18 million. "That seemed fair," he says in an interview. "I'm not being totally facetious." Does that mean that the next Survivor contestants will be able to commission a fee? Or the morons who lock themselves inside a Big Brother house? Part of the appeal of reality programing for networks has been their relative cheap production costs. With their huge success in the ratings more and more personalities are going to up their cut provided they can get another go. Over at Brand Autopsy yesterday, they had a link to a paper by Alex Wipperfürth called "A Dangerous Attitude" outlines the fallacy of being cool. As with most of the stuff over at BA; this deserves a read (whether you are into marketing or not). By definition, cool will only appeal to a minority, never the mass-volume mainstream. Very few brands attain lasting, sustainable coolness. If they’re successful, the brands achieve mainstream popularity … which makes them uncool. It’s often ambiguous and always subjective – it lies in the eye of the (cool-hunting) beholder. Cool is inherently difficult to measure. It’s an attitude that can’t be captured with conventional market research. In asking your most loyal supports whether (and why) they think your brand is cool, you risk losing them by trying to make them feel self-aware about a sub-conscious feeling. Cool brands dare to be imperfect. While cool brands are unique, they are by no means perfect. In fact, their limitations and eccentric flaws are part of what makes them cool. Imperfection breeds cool. Cool brands see something others don’t. They are extremely observant and intuitive. The have their finger on the pulse of society, and they’re not afraid to challenge the norms. Cool brands have nothing to prove. Cool brands are led by people who are trying to bring something they love and appreciate – an experience, a product, an environment – to others. They stand up for their beliefs, even if that means they won’t appeal to the masses. Thanks BA and thanks Alex! Google has released new figures for its IPO overnight. Shares will be priced between $US108 ($150) and $US135 ($190), meaning up to $US3.3 billion will be raised and the company will be valued at up to $US36.25 billion ($51bn) - $US10 billion more than General Motors (America's biggest carmaker) - which would rank it fourth biggest in Australia. Check out Google's SEC filing in full here. Just six years after starting the company, the two founders - Sergey Brin and Larry Page - are selling about $180 million worth of shares each in the float but will retain about $8 billion each at the top end of the valuation. After the offering, Brin, Page and CEO Eric Schmidt will control 38 per cent of Google's shares, but they will have 60 per cent of the votes, because their shares carry 10 times the voting power of those sold to the public. Rupert would be proud of such a gerrymander. Of the 24.6 million shares to be sold, 10.4 million are held by current shareholders and there are some interesting names amongst the investors looking to cash in. Now one of Google's main competitors, Yahoo was an early investor in the search engine and plans to sell off $105 million of its $1 billion stake, while AOL-Time Warner will sell $141 million of its $1.4 billion stake. Stanford University, where the obsessively secretive Brin and Page met as students, is also planning to sell about $31 million of its stock holding. David Cheriton, the Stanford University computer professor who was a mentor to Brin and Page, will cash in about 10 percent of his holdings - worth an estimated $58 million. But the biggest winners will be Silicon Valley venture capitalists Kleiner Perkins and Sequoia Capital, who provided $US25 million in equity funding for the company back in 1999. The firms now plan to sell about 10 percent of their holdings, worth over $350 million each, according to public filings. That wasn't the only news on google yesterday. The other piece of news -- which went mostly unnoticed -- was that spammers had brought down the search engine for about three hours in the morning. During that period, untold number of Google users got error messages or waited for longer periods to get their results. The culprit was a barrage of search queries from computers infected with variants of the MyDoom virus, a worm coded by a German high school student. The queries had significantly slowed down Google's response and caused the outage. But Google's incredible success certainly puts Australia's feeble IT industry to shame. Shareholders of Solution 6 today voted in favour of a proposed merger with fellow software maker MYOB to form Australia's biggest software company. But at just $233 million it doesn't even come close to Australia's 150 companies. Australia has barely had a successful large scale start-up company in any area over the last 30 years. Computershare (established in 1978) and Billabong (1973) are the most recent start-ups, which make Australia's top 100. Before that Tabcorp was set up as a government run betting agency in 1961. That's pretty pathetic. The contrast with America is stark where close to a majority of its top 20 companies didn't exist in 1970. Still, at least we've got our booming gaming industry, a profitable banking cartel and an efficient grocery retailing duopoly. Oh, and we're also great at sport thanks largely to our East German approach to churning out taxpayer-funded gold medal winners! Have your brought a drink from your local Milk Bar, Service Station of Lunch Shop lately? It's a bit like trying to buy a toothbrush! The fridge is packed with a plethora of tempting beverages; from juices to flavoured milk, energy drinks to "performance waters". So if you are going to have a product in this over-crowded "fast moving consumer goods" segment, you'd better be different. I had heard of Nudie Juice before, only because their factory had burnt down! But I had my first Nudie Juice today, something called “strawberry, banana and more” in a bottle marked “Limited Edition Fire Fighter Nudie”. "On Thursday May 27 2004, nudie headquarters burnt down. Fortunately, thanks to the efforts of brave fire fighters, no one was hurt. But we lost all our squeezing machines and lost of good fruit. Which meant we couldn’t make any nudies for a while. But it takes more than a fire to keep nudies down. And this “limited edition fire fighter nudie” is proof. Cool huh! Find me another bottle in the 7-11 fridge that is as entertaining. In 18 months, this cheeky little juice company has,with little or no advertising, generated sales in excess of $12 million. "I wanted a dialogue with our customers; that's why we use the website and I answer 40 emails a day personally," he said. "It has worked; our customers have become salespeople simply by asking shopkeepers to stock our juices. "It is an amazingly powerful tool and the response has been overwhelming." The only potential downside in this story? This innovative Australian small business little has recently merged with the Pulp group of juice chains - 20 per cent owned by Richard Branson and 80 per cent by the public company Signature Brands. Hopefully they keep the "it" that they have at the moment! Oh, and the juice tastes really good too! I don't suffer from Mondayitis... and I have worked out why. It's cause I don't really stop properly on the weekend; I just motor through them at the same hectic pace that sees Monday to Friday out. It's not like I work or anything like that, but because I know that I only have two days off before Monday, I feel the need to squash as much as I can into those two days; packing my time with 'valid' pursuits that don't actually allow me to rest properly. But what is interesting is that I feel like I am betraying my employer more than myself when I am less productive than I like to be at work. I know that rest and rejuvenation are important to higher levels of productivity. All production without a recharge results in lower production, which was me today! The standard axiom is that all work and no play makes Shannon a dull boy, but a pile of research since WWII shows it also makes Shannon less productive. * Take off your watch and leave it (along with your diary) on the bedroom dresser. * Leave all your business reading behind. Only non-work related reading material allowed. * Avoid making firm time commitments wherever possible. Instead of being someplace “right at 3:00,” plan on being somewhere “in the afternoon” or “between 2:00 and 4:00.” Remember, the objective is to relax. I could actually do those things! It might even help me. I'll let you know next Monday! Statistics are always interesting to look at. I read different blogs for different reasons; some for news, some for unbiased views, some for biased views, others for stuff I can't get elsewhere, some just for the fun of it and some I read just because I can! members communicate in language that is natural, open, honest, direct, funny and often shocking. Whether explaining or complaining, joking or serious, the human voice is unmistakably genuine. It can't be faked. But of course, there will always be some folk who try to gather statistics on things like weblogs. To me it's a bit like endeavouring to investigate and collate statitistics about why people talk to each other, why they converse, why they interact.... in the end you get a a stack of information that isn't really new, is mainly boring, and no one really cares too much... we'll do what we ant anyway! Interviewer said "I shall either ask you ten easy questions or one really difficult question. Think well before you make up your mind!" The boy thought for a while and said, "my choice is one really difficult question." "Well, good luck to you, you have made your own choice! Now tell me this. "What comes first, Day or Night?" The boy was jolted into reality as his admission depends on the correctness of his answer, but he thought for a while and said, "It's the DAY sir!" "How" the interviewer asked, "Sorry sir, you promised me that you will not ask me a SECOND difficult question!" "Technical Skill is the mastery of complexity, while Creativity is the master of simplicity..."
I spent all day in meetings today; but they weren't like that! In fact today's meetings were pretty productive, but they aren't always that way. 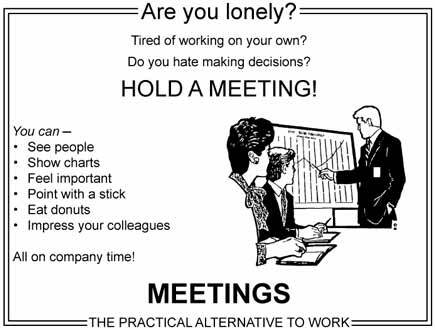 Who says meetings are a colossal waste of time? Mai Wang uses them to catch up on thank-you notes from birthday and Christmas presents past. "I bring my calligraphy pen," says the 32-year-old consultant. Bernie DeKoven ran the Institute for Better Meetings for more than 15 years, but he folded it two years ago because it was hard to make money and he realized there was cultural resistance to improving meetings. He wanted them to be collaborative and fun, he says, but concedes, "I was naive." Instead, Mr. DeKoven says, meetings are ceremonies to reinforce the hierarchy, to remind people who's boss, and to praise or chastise anyone who isn't. If people would just accept that that's their purpose, he adds, meetings could be shorter and cheaper. "But people cloud the issue by trying to get something done." The need to know how to deal with the political at work is very great. They should teach kids this at school. Given his recent experience in a big coroprate, I reakon Tony Goodson would agree! It seems as though Mark Latham and the ALP have replaced the batteries in their faulty budget calculator!It was reported today that they have "dramatically downgraded some of its earlier promises in key policy areas as it scrambles to keep its spending under control and free up cash for its promised tax relief." Hmmm. Who would have thought? Labor, facing Coalition attacks on its financial credibility, has been combing the budget for savings to pay for a growing list of promises. After claiming the Government's $14.7 billion income tax cut ignored people earning less than $52,000 a year, Mr Latham promised tax relief for all. Gotta pay for it though Mark! Fact 1: As Mayor, Mark Latham went on a $36 million spending spree, which he claimed would be funded through unspecified savings. Fact 2: Liverpool Council’s auditor stated publicly that those ‘savings’ never eventuated, leaving the Council with significant spending obligations and a rapidly deteriorating financial position. Fact 3: In Mark Latham’s last year as Mayor, Liverpool City Council reported a $2.7 million working capital deficit – a fact borne out by the audited financial statements for that year. Fact 4: Mark Latham’s mismanagement meant that the working capital deficit was on track to blow out to $15.4 million by 1995/96 – a deficit which the auditor said was amongst the highest he had ever experienced and which led to the Council being placed on a Department of Local Government Watch List. Fact 5: Labor Alderman Wendy Waller and former Liverpool General Manager Brian Carr both clearly attributed the Council’s financial woes to Latham’s policies as Mayor. Latham has been unable to refute these facts. He has been unable to substantiate his claim that he left Liverpool City Council with a working capital surplus. Nor has he been able to substantiate his claim that he cut staff numbers from 500 to 400. Payroll records from the Council indicate that in 1994 staff numbers were 500. Unfortunately, the Labor Party appears to have adopted Latham’s approach to financial management; lots of big spending promises, paid for by unspecified savings. The simple reality- and I am not the first one to identify it- is that Mark Latham could not run a local council, and he cannot be trusted with an $800 billion economy. Dakar Rally: The Worl'd Most Dangerous Sporting Event?